"Handcrafted accent furniture that blends with the decor and stands alone as art." Andrea Wendel designs and crafts functional home accents. One-of-its-kind and custom pieces that make an “out of the ordinary” style impact to your décor. Home accents that are inspired by nature, indigenous cultures and a curious eye. 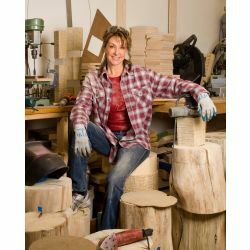 In the Andi-Le studio, based outside of Aspen, Colorado, large components are sculpted and the surfaces become blank canvases where the play of textures and inlays takes place. Andrea majored in Illustration at Moore College of Art in Philadelphia. As a muralist, her clients were residential as well as commercial, painting in many hotels and restaurants across the country. Beginning in 1990 sculpture took over. Large totemic work turned in to barstools and the rest is history. Form and function became her passion. With the founding of Andi-Le in 2002, Andrea has worked with clients, designers and architects to bring their vision to life as well as being represented in galleries for her unique work.